Modern electric lifting trucks, order pickers, tugs, and mobile transport platforms provide users with additional potential benefits thanks to the option of semi-autonomous operation. 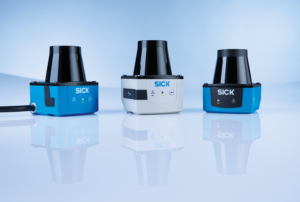 As well as ensuring that vehicles make collision-free journeys, 2D LiDAR sensors from SICK’s TiM series also deliver precise measurement data for navigation purposes. What’s more, a 2D LiDAR sensor with performance level b is now available for the first time to cater to safety-related applications. In many intralogistics systems, a trend toward smaller and more flexible transport and picking vehicles can be identified. The reason for this is that it is often easier for these vehicles to adapt their transport capacities to daily fluctuations and seasonal peaks as well as to changes in order and customer structures. To enable them to operate autonomously – be it individually or in a network – they need to be protected against collisions in an intelligent manner and equipped with the option to navigate for themselves. This is all because the vehicles need to be able to find their way through the halls by themselves and have to be able to deal with virtually any kind of obstacle that may come their way. 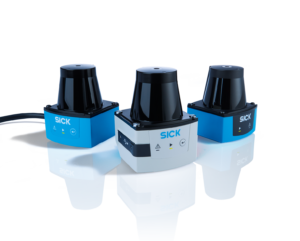 The various TiM product families from SICK offer application-oriented solutions here as, first and foremost, they meet key device-related requirements. The compact TiM5xx, for example, which is used for simultaneous object detection, position detection, and navigation, has an overall height of just 86 millimeters, making it easy to integrate even in confined installation spaces. Their low weight and power consumption also play an important role – particularly in mobile applications. The TiM1xx weighs just 90 grams and requires just 2.2 W of power. Its energy efficiency and compact design satisfy the highest requirements in terms of functionality and mobility, as well as the desire for long, interruption-free operating times for the vehicles. TiM sensors also impress thanks to their well-thought-out industrial design, which considers shock and vibration resistance as well as ambient light immunity. In addition, they are designed for quick and simple plug & play integration, which is an important factor in terms of ensuring the availability of autonomous, intralogistics vehicles in the event that the sensors need replacing. The next requirement concerns the sensor technology itself. Above all else, the technology must not pose any risk or hazard to the people present in the operating environment. What’s more, detection capability must be designed so that different materials, surface structures, and colors are detected to the same degree of reliability – irrespective of influences from the operating environment such as dazzling sunlight or darkness. The sensors’ resolution has to be so fine that mobile obstacles in particular – objects and people – are reliably detected in addition to stationary hall elements. Thanks to their innovative HDDM technology, all 2D LiDAR product families also satisfy the highest requirements in terms of detection accuracy. In mobile applications such as collision avoidance on service robots and mobile platforms as well as in stationary tasks such as access control on pick & place robots, risk analyses in many cases find that protection in accordance with performance level b is the most efficient solution from a technical and economical point of view. For industrial applications of this nature, the TiM361S is the first safety-certified 2D LiDAR sensor to be available with performance level b in accordance with EN ISO 13849-1:2015. In the safe working range from 0.05 cm to 4 m, up to 48 independent monitoring fields and as many monitoring scenarios and protective field geometries as required can be set up. The TiM361S represents the perfect union between measurement performance and functional safety and fits seamlessly into SICK’s existing 2D LiDAR product portfolio. 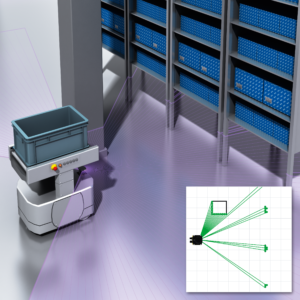 With the integration of two TiM3xx area sensors in one order picker, it is possible to perform autonomous transport tasks without the risk of collisions. When the forklift element picks up the load, a TiM3xx detects the position of a pallet, for example. The sensor doesn’t just detect a possible obstacle between a vehicle and pallet – it can also assist the vehicle control when lifting a pallet. During transportation, a front-mounted TiM monitors the route – at an angle of 270° and in a working range of up to ten meters. A whole host of monitoring scenarios can be stored in the sensor for such purposes. 16 pre-configured triple field sets are available in the form of message, warning, and stopping fields, whose shapes can be defined as rectangular, radial, or as free geometries. The configuration of a field set can be adjusted directly at the sensor so that special requirements from the application can be implemented directly on site. To prevent the risk of unintended sensor misalignment, various device versions have “contour as reference” functionality, which allows these LiDAR sensors to monitor for correct alignment themselves. If, in addition to route monitoring, the operating environment is also to be recorded for navigation purposes, the TiM5xx product family delivers the measurement data needed for this. These navigation functions also come into play when used on autonomous mobile robots, which pick items by themselves and then set off for the various warehouse aisles and picking areas independently. With its working range of up to 25 meters, the TiM5xx LiDAR sensor provides both order pickers and self-driving robots with the necessary range of vision to avoid collisions and to collect navigation-related information from the operating environment. With a possible resolution of 0.33° within a scanning field of 270°, the TiM571 provides highly accurate measurement data from the scanned surface. This enables even very small obstacles and orientation marks to be detected and their distances to be determined. The measurement data itself is output via USB or Ethernet interface in the form of a machine-readable string and processed further in the higher-level applications of the vehicle control. As a rule, a single TiM571 will generally be sufficient for both order pickers and mobile platforms, as the pickers have a preferred direction of travel and the platforms generally rotate on the spot to enable them to travel in the required direction. Autonomous-mobile intralogistics requires intelligent sensors which deliver real-time information to self-driving vehicles and platforms regarding their environment. The 2D LiDAR sensors in the TiM series offer the necessary precision, reliability, and speed to reliably avoid collisions and to provide effective support to higher-level systems used for navigation and position determination purposes. The 2D LiDAR sensors (Light Detection And Ranging) of the TiM product families use eye-safe infrared light (laser class 1) and the HDDM technology (High Definition Distance Measurement) developed and patented by SICK. The latter is a high-resolution digital process for measuring time and distance, which sends out around 100 times more laser pulses than other time-of-flight measurement systems in the same period. The short sequence of pulses and the low angular resolution in the scan plane of up to 0.33° provided by the TiM3xx and TiM5xx guarantee an uninterrupted scan and reliable detection and measurement functions. The HDDM measurement process also provides very high optical reliability. Thanks to this high ambient light immunity, it is almost impossible for the TiM sensors to be dazzled either by bright daylight or by high-frequency artificial ambient lighting, as is typical in an intralogistics environment. The measurement process can also compensate for the effects of dust, dirt, and moisture in the environment. A field, an aperture angle of 200°, a working range of up to three meters, and a switching output for field evaluation – the TiM100 is the entry-level series in 2D surface monitoring. Yet despite being an entry-level model, this LiDAR sensor has a lot of offer – including IO-Link for simplified commissioning and diagnostics, as well as the more advanced HDDM+ process, which has enhanced the reliability of this millimeter-precision detection process even further. Intralogistics applications such as empty bay detection in pallet and container warehouses or protrusion monitoring for mesh boxes are also able to benefit from this.